I stated in my last blog entry that I was going to attend this past Friday’s Durham Bulls game versus the Pawtucket Red Sox; which I did. I didn’t however announce that I’d be attending yesterday’s game versus the Charlotte Knights as well. There’s a good reason for that. At the time, I didn’t know I’d be going. It was a last minute decision, which turned out to be a great one. I’m not going to spend a lot of time talking about either game, but I thought I’d give a brief overview of my time spent at the ballpark over the past few days. 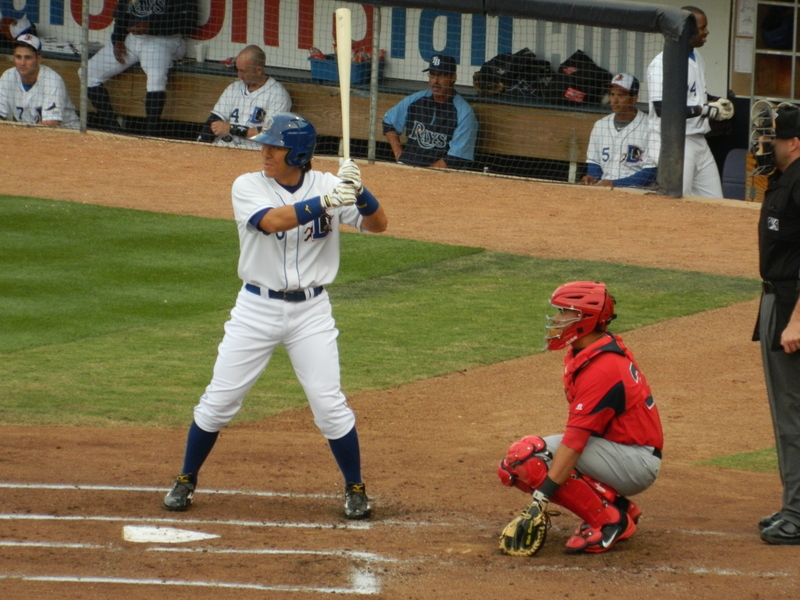 I normally wouldn’t blog about a MiLB game but considering the fact that the 2009 World Series MVP, Hideki Matsui, is currently playing with the Bulls, I thought I’d type up this little entry. The moment I heard that Kevin Youkilis was going to be rehabbing with the PawSox I knew I’d be attending this game. But going back even further in time, I knew I’d be attending one of the four games versus the Sox from the day the schedule was first released. My day at the ballpark started out like every other game of my life: With me standing in line outside of the ballpark, waiting for the gates to open up. It’s one of the things that is a MUST for me. Showing up early to be one of the first inside is something I’ve always enjoyed doing. Once the gates opened up I made my way past the mobs of the people in Red Sox gear and down to the PawSox dugout. I then proceeded to wait for the players to make their way up the steps from the clubhouse. It seemed to take them longer than usual. The first player out of the clubhouse was Jose Iglesias, but he flat out ignored my autograph request. Next up was Lars Anderson. I was promptly denied again. I couldn’t help but think that it wasn’t going to be a good day for autograph collecting, and for the most part, I was right. I only got two autographs at this game. One from Kevin Youkilis, and another from Gerald Perry. Not a great day, but at least I got Youk. Moving on to the game itself. It was really exciting to say the least. Down 4-3 in the bottom of the 8th, Jesus Feliciano stepped up to the plate with the bases loaded and proceeded to clear them on a 3 run triple. The ballpark was electric. You should’ve been there. After the game I dashed back to the PawSox dugout to ask their manager for the lineup cards, but was told that they never give those out. I know for a fact that’s a lie, but I just let it be. I didn’t want to cause a scene. All in all it was a great game. The Bulls won. I was successful in getting an auto from Kevin Youkilis. 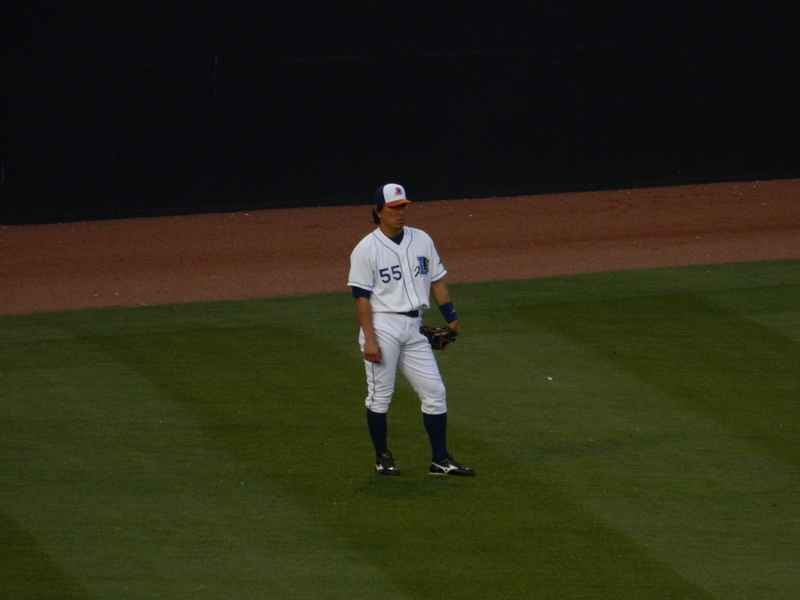 And I got to see Matsui play. I’ll take that kind of game every day of the week. Hideki Matsui walking away after signing autograph for a few kids. 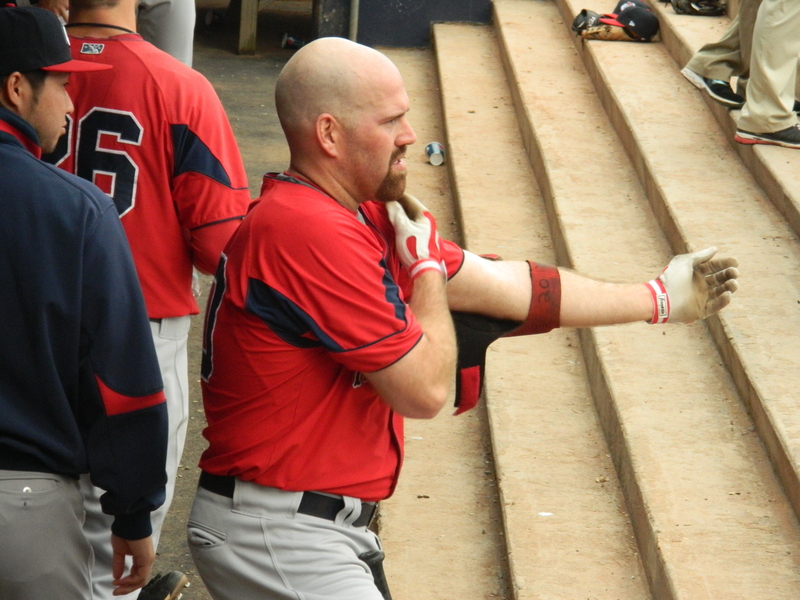 Kevin Youkilis getting ready for the game. 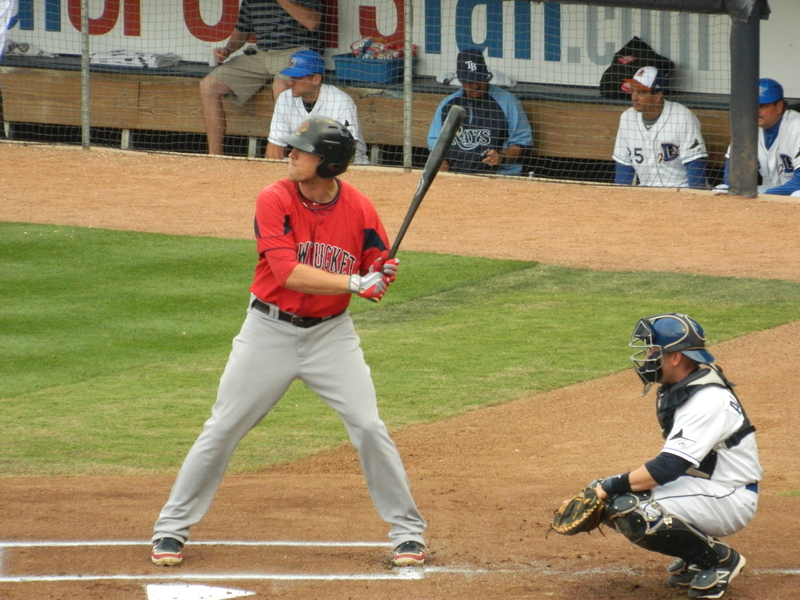 Lars Anderson in his first at bat. 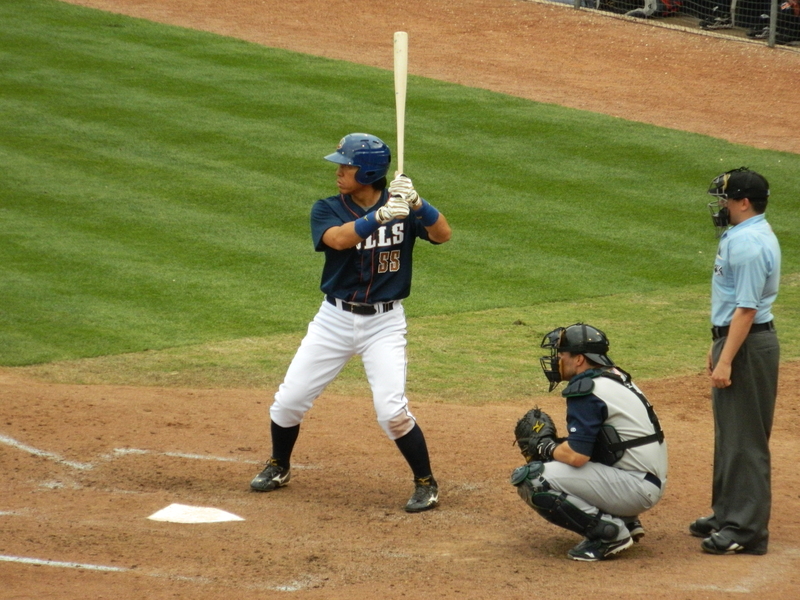 Hideki Matsui in his first at bat. And that’s all she (or in this case, *he*) wrote. I hadn’t planned on attending this game, but I REALLY wanted to get an autograph from Hideki Matsui. This was going to be my last Bulls game until June 8th, and who knows if Matsui will still be on the team then. I knew it wasn’t a guarantee that I’d get him to sign for me, but I at least had to try. The day started out with me making friends with a relatively nice usher down by the Bulls’ dugout. This would turn out to be important. More on that a little later. My main autograph target for the day, as stated earlier, was Matsui, but there were a few other guys I wanted as well. Leslie Anderson has been tearing it up this year, and Tampa Bay Rays number 3 prospect Chris Archer has been having a good year as well, so I was going for their autos too. I was all by myself down by the dugout for the first ten or so minutes after the gates opened. After that, however, people showed up in bunches, and before long there were 10 or so fellow autograph seekers, including a young kid who decided it was necessary to continuously kick me in the back of the legs. But I digress. I completely missed the arrival of Leslie Anderson from the clubhouse. He came out while I was looking at something that was happening on the field, and by the time I noticed him he was heading onto the field to warm up. I made sure not to turn my head after that. I didn’t want to miss Matsui. Several minutes passed by and still no sign of Matsui. Finally, after 30 minutes of standing there waiting, he appeared. I was the first one to notice him, and proceeded to hollar “Hideki! !” all while holding out my card and sharpie (which apparently isn’t the universal sign for “can I have your autograph”?). 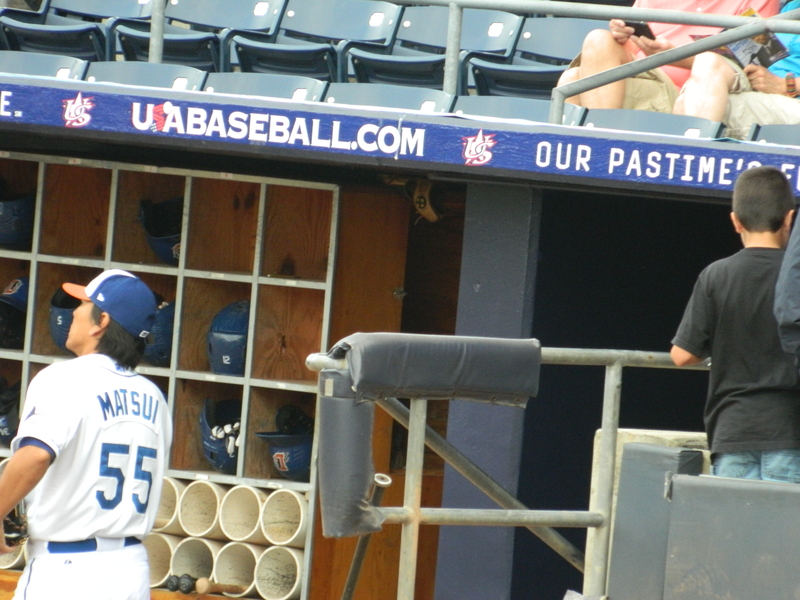 Matsui looked up at me and nodded, but an acknowledgement is all I got. He ran up the steps and onto the field. No auto love from Matsui, but I did get Chris Archer just before I went to my seat. So I was glad about that. The only other people down by the dugout were people who had nearby seats. They were all after Matsui’s autograph, and to my surprise he actually stopped to sign. He only signed for four people, but I am happy to state that I WAS one of the lucky few. I have my usher buddy to thank for that. If you’re ever in the area I highly suggest you make a trip to Durham to see a ball game. It’s an awesome ballpark, and you’ll have the time of your life. Guaranteed. This entry was posted in Dailies and tagged AL, Baseball, Charlotte Knights, Durham Bulls, Hideki Matsui, Kevin Youkilis, MiLB, MLB, Pawtucket Red Sox, Rays, Red Sox, White Sox by Matt Huddleston. Bookmark the permalink.